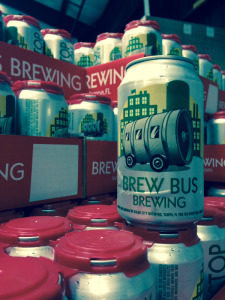 With some recent changes being made by Tampa Bay Brew Bus to their beer line, they have announced today the official launch of Brew Bus Brewing and their line of canned beers produced at Cigar City Brewing. The following was released by President, Anthony Derby. “Today is the day that we launch Brew Bus Brewing! Formally Tampa Bay Brew Bus Beer, we intend to separate our successful Brew Bus tour program from our craft beer line of cans to allow for further success for both branches of our business. Our first can release is our Last Stop IPA. This new brand was well received back in August when it was first released in kegs. A recipe by Josh Brengle, lead brewer at Cigar City Brewing in Tampa, FL, this hop bomb is brewed with Magnum, Centennial, Columbus, Amarillo, Simcoe, and Citra hops. Clocking in at 7.2% this highly drinkable, paler IPA lends towards heavy doses of citrus and tropical flavors. Available distribution in cans and kegs with JJ Taylor Florida Distributing and Brown Distributing. During the next month you will see our other brands being released in cans, including: Rollin Dirty Irish Red Ale, Are Wheat There Yet? American Wheat Ale, and our all-natural blueberry wheat ale called You’re My Boy, Blue. We will continue to support our local community wherever we have a Brew Bus location. It has always been my mission to further promote the craft beer movement while increasing the economic impact to local breweries, craft beer bars, and brewpubs.